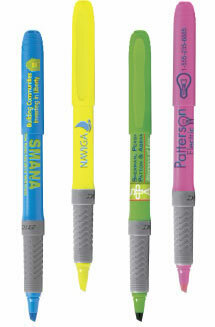 What makes Bic Grip Brite Liner Highlighter Pens better? Bic Grip Brite Liner Highlighter Pens have a comfortable gray textured rubber grip, the fast drying ink provides for clean precise highlighting. The two piece Brite Liner highlighter pens have a pocket clip. Our revolutionary imprinting process gives superior imprinting for your advertising message or logo. Bic Grip Brite Liner highlighter pens ensures that your name will be associated with a quality writing pen and with the use of high quality materials and ink cartridges ensures longevity of your advertising message. Your custom advertising message can be printed on the pen barrel or pen cap. Price Each: $1.09 $1.07 $1.04 .97 . Above are for one color of imprint on cap or pen barrel. Production Time: 8 working days, plus UPS shipping time.